MANILA -- The US Navy won't alter its so-called "freedom of navigation" sail-bys in the disputed South China Sea and has pressed ahead with such operations despite a dangerous maneuver by a Chinese navy ship against an American destroyer, a senior US Navy commander said Monday. 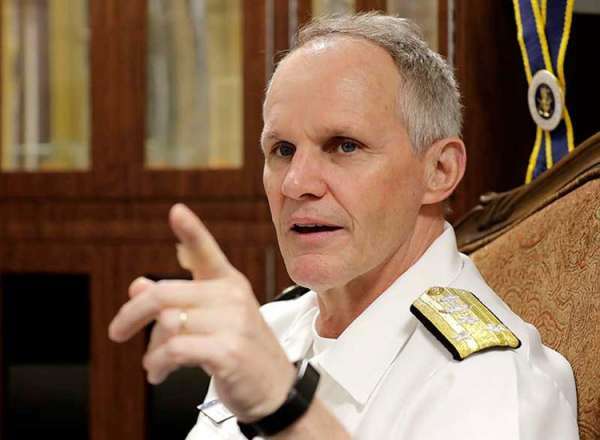 Vice Adm. Phillip Sawyer, commander of the US 7th Fleet, told reporters in Manila that Washington protested that "unprofessional behavior" by the Chinese ship, which maneuvered very close to the USS Decatur as the latter sailed closely by a Chinese-occupied island in the Spratlys in September. "No, it's not going to change where we do our freedom of navigation operations," Sawyer said when asked if the Sept. 30 incident off Gaven Reef would change such US Navy operations. Several such sail-bys have been undertaken by American naval ships since that close encounter in the disputed waters, he said. "It was concerning because the ships got too close," Sawyer said, adding that US officials have voiced "our displeasure with what we consider to be unprofessional behavior." The USS Decatur had sailed within 12 nautical miles of Gaven Reef when a Chinese destroyer dangerously approached within 45 yards (41 meters) of the bow of the US Navy ship, which changed course to prevent a collision. The Decatur was also warned to leave the area, US Pacific Fleet officials said at the time. China said the Luoyang, a Chinese missile destroyer, was deployed to identify the US warship and drive it away near Chinese territory. Beijing protested the Decatur's action as provocative. While Washington has no claims to the strategic waterway, it has declared that freedom of navigation and the peaceful resolution of the disputes are in the US national interest. The US has also questioned China's expansive claims, bringing it into a collision course with Beijing. The US Navy will continue freedom of navigation sail-bys and patrols in the South China Sea and elsewhere "until there are no excessive maritime claims throughout the world," said Sawyer, who spoke onboard the USS Blue Ridge, which arrived in Manila on Thursday for a visit after sailing through the South China Sea. China has long been wary of the US military presence in the disputed waterway and has asked Washington not to meddle in a purely Asian dispute. The US has insisted the routine patrols and exercises it has carried out with allies in the region for more than 70 years has helped foster the regional stability that has allowed many Asian countries to prosper economically.